Many integration patterns involve messages being received, transformed, enriched and sent onwards. The Oracle Enterprise Service Bus supports most of these patterns and operations, but not all of them in a very straightforward manner. For enriching a message from an ESB Service and then sending it to another than the enriching adapter service is not a trivial task. However simple this scenario, the Oracle ESB has no trivial way of implementing the enrichment of an incoming message. There has been some discussion on the OTN Forums (http://forums.oracle.com/forums/thread.jspa?threadID=455872&tstart=0) and there is a sample available on OTN that shows some of the desired end-result, but it is a little unclear how that is put together. In this article, we will look at a detailed implementation of the message enrichment scenario, as described above. 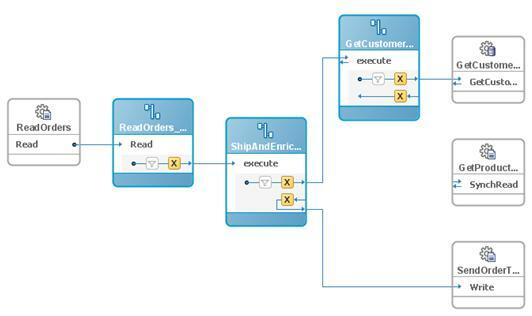 See for the entire tutorial: Enriching and Forwarding with Oracle ESB. Our organization daily receives many orders for different products from hundreds of customers from all over the country. These orders are sent by our dealers, via FTP, every file containing a single order. The order contains limited information: the customer id, a product id and an indication of the number of specimens of the product the customer wants to receive. customer, as expediently as possible – as speed is our middle name! have to invoke for delivering the Order. Simple enough, you would say. Piece of cake for the ESB. Our scenario has a little catch though: the order as we receive it only contains three numbers: customer id, product id and quantity. However, the Shipping Department does not deal in Customer Ids. It needs to have a shipping address! So it is our challenge to turn the Customer Id into a set of Customer data, including the Customer’s Shipping Address. After enriching the message with that data, we can forward it to the Shipping Department. We can use a Database View from which we can query the customer data, based on the customer id. Here we have the ESB Service invoke one service to return a piece of information that is added to the message-in-transit that is then sent to another Service. It is not as simple as it may look at first. The tutorial contains a complete, step by step description of how to get this service implemented . 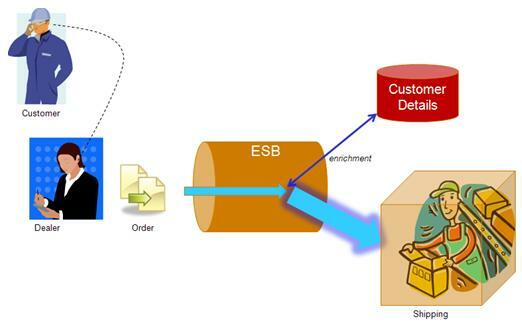 Download Tutorial Enriching and Forwarding with Oracle Enterprise Service Bus. Jarek, I am sorry for the inconvenience. The correct URL should be: http://www.amis.nl//files/technology/ESB_Enrichment_Tutorial_and_Materials.zip. I have corrected the article accordingly. This url is not pointing to correct download site for ESB sample code – Tutorial Enriching and Forwarding with Oracle Enterprise Service Bus. http://www.amis.nl//images/banners/ESB_Enrichment_Tutorial_and_Materials.zip.